People in Singapore eat our a lot! People in Singapore loves to eat too! 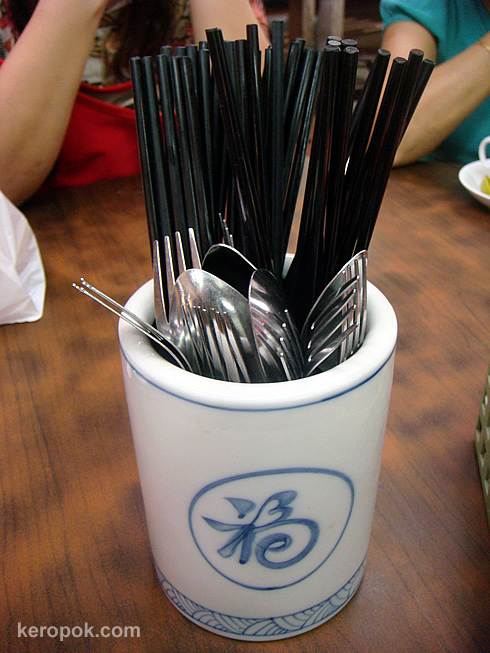 Many places that you go to, the utensils are in containers like this. Usually there would be chopsticks, forks and spoons. Prince George's Park - looks like a resort for students! Wow, the students residences are nice! 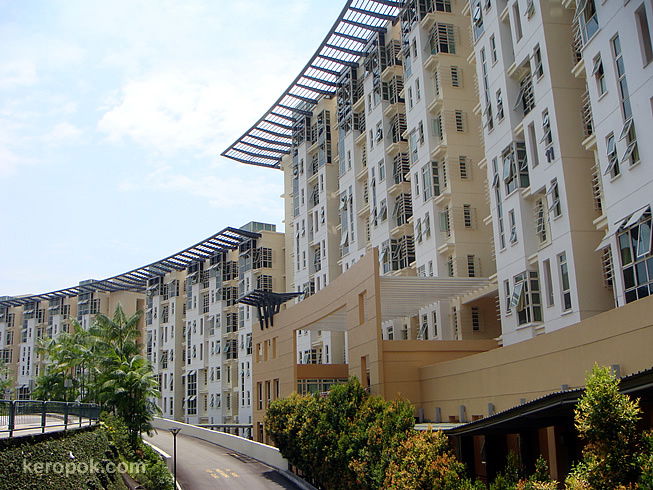 One of the many residences available to the students at NUS, this looks very resort like. I am curious to find out how it looks inside, but no, I did not go in and see how it looks. Anyone of you stayed in student residences when you were studying? I did for a few years. It was the city down under. I stayed in two. "Alan Ramsay House" for high school years. "Frank Tate House" for university. 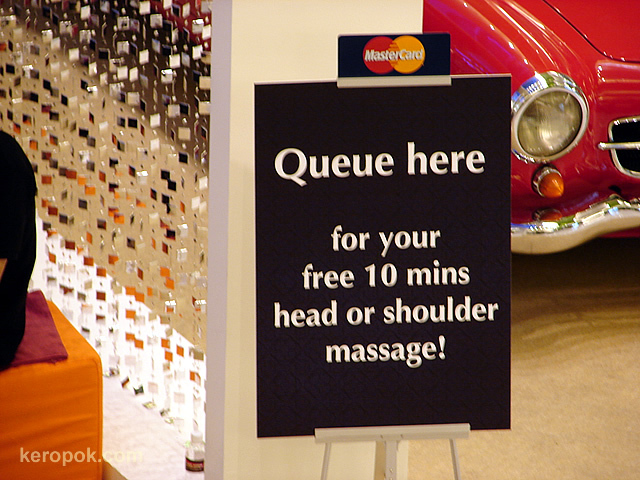 Yesterday while walking around a shopping mall, I saw this..
Free 10 min massages. I guess it must be what busy shoppers in this shopping mall needed. Recently, the NUS environmental club, NUSSU Students Against Violation of the Earth (SAVE) organized the Green Carnival. One of the highlights (to me) is the visit to Environment Visits. 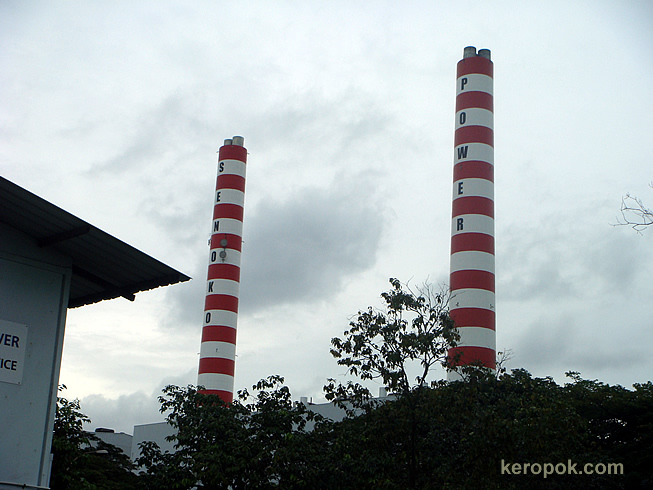 I have never been to a power station, and wanted to visit! The visit was interesting. Security was very tight. We had to send our details to be vetted way way before. When we reached in the bus, security came aboard and handed up envelopes for us to put in any mobile phones with cameras and cameras inside. This picture was taken just before we went in, in the bus! haha..
You might be wondering how I took the next photo since we handed up our cameras? Just before we left, people from Senoko returned our stuff to us, after we have finished all the visitation. They allowed us to take a group photo and they were gracious to take it for us too! I am impressed that how power is generated and what this company does to make it one of the most efficient and greenest plant in Asia. 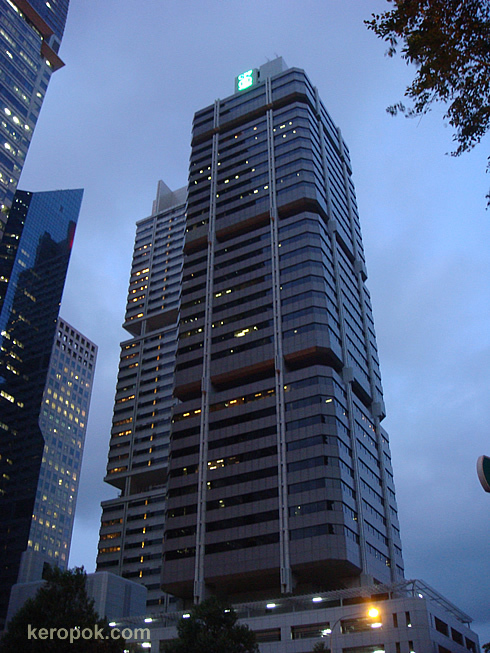 Singapore does not have any natural resources, so natural gas is the greenest fuel to power production. 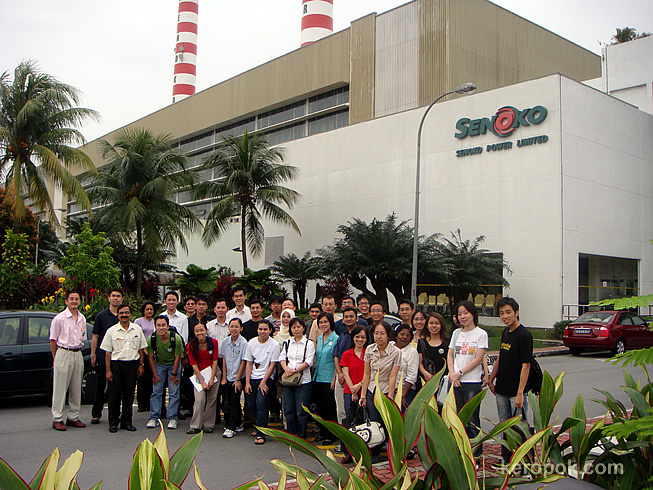 Just yesterday, there was a news report that Singapore will have the biggest solar manufacturing complex in the world. Hope that this will boost the greener energy in Singapore. The visit was made possible by NUSSU SAVE and this lady from the NUS Campus Sustainability Committee. We should applaud them for making significant changes for the environment. Hmmm reading their website, maybe NUS is the greenest education institution in Singapore? Do you or the organization you work with, do your part for the environment? The organization that I work with, recently set the air-con temperate higher at 25 Celcius. I hope this will reduce our carbon footprint. 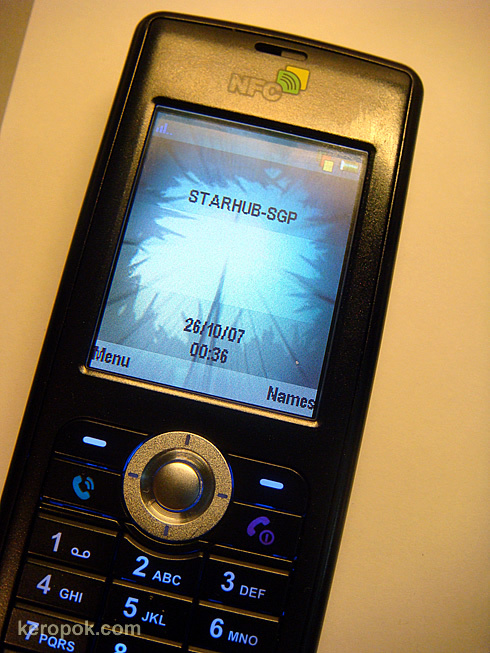 I thought it will be interesting to trial out a Near Field Communication (NFC) phone. I signed up for the trial and got to be a tester. I have had the phone since two Thursday ago. I am yet to try out other stuff. But I tested this out. 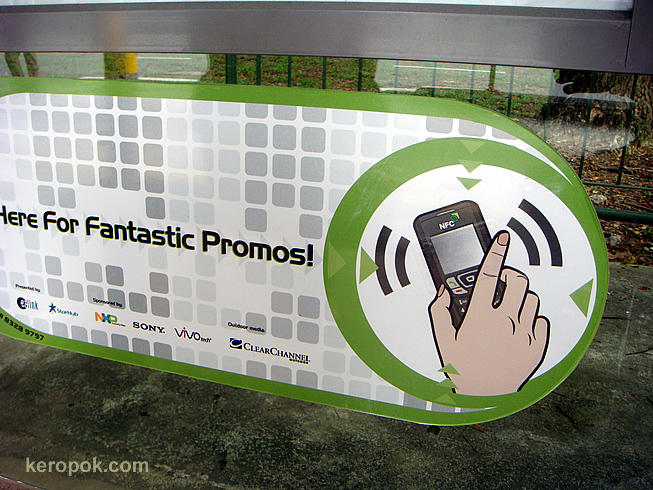 At certain bus stops, when you activate the NFC function and bring it near this logo, you will be able to download info. My bus came, and I did not complete the download. haha.. Another time maybe..
Do you like to be testers for products? Do your city has similar NFC trials going on? Those in Singapore, are you on the NFC trial? Caught on the red-light camera. 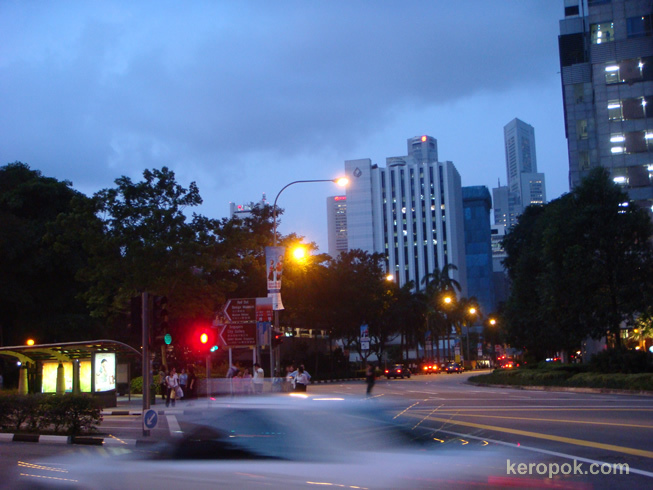 The red light cameras at the traffic lights junctions in Singapore looks like this. If I am not mistaken, they are captured on film and someone has to physically retrieve the films, then the summons are sent to those who beat the red lights. Do they look similar from where you come from? This building must have one of the most interesting add-ons on top of the building. Some people call it the flying saucer building. 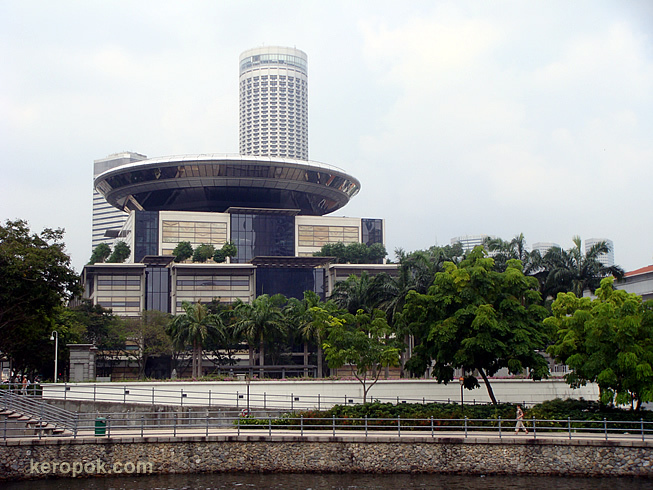 On this picture is also the tallest hotel in Singapore, taken by the Singapore River. Doesn't it look very futuristic? Last few day's photos are places where tourist to Singapore will take photos of. This is another activity that many tourist will do. 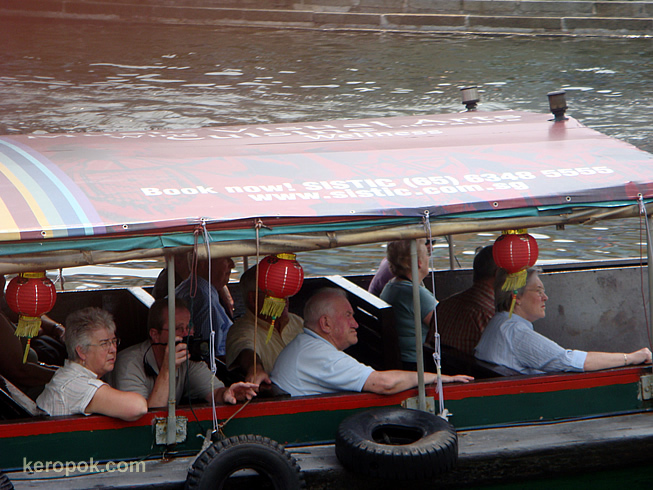 Get on a boat ride along the Singapore River. Actually, I have not been on a boat ride in Singapore! I have done it in other cities though. haha... Rowed a kayak along the starting of Yarra River in Melbourne, taken the river cruise along Seine River in Paris, the cruise along Chao Praya in Bangkok, etc..
What a surprise, I never read this until a few days ago when I took a photo of this. 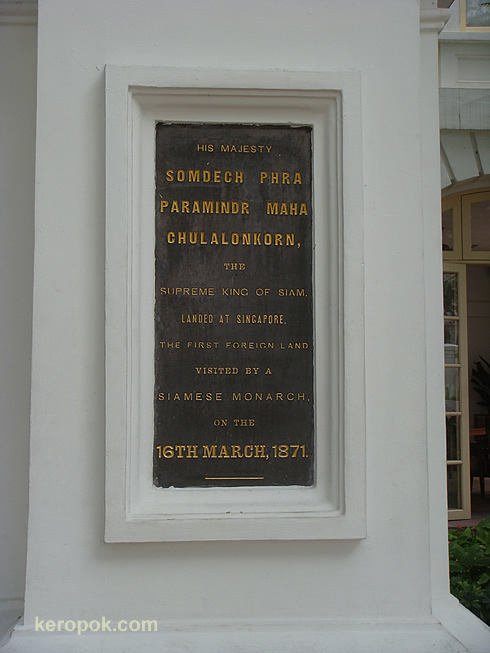 Singapore is the first foreign land visited by a siamese monarch. Now, what about you? Where was the first foreign land that you visited? This is a very much photograph image in Singapore. 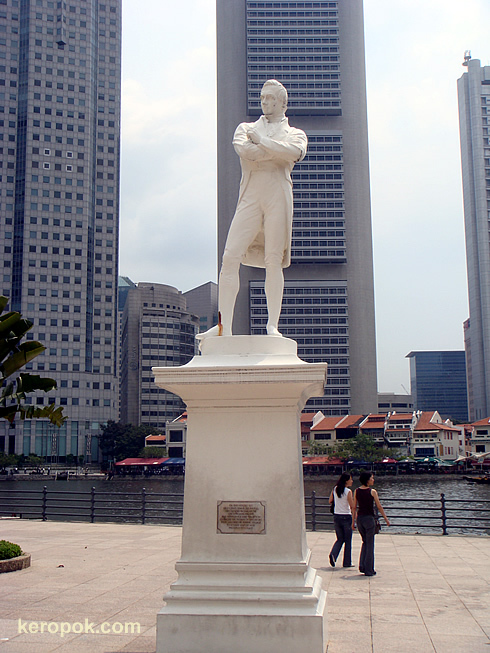 This is the statue of Stamford Raffles by the Singapore River. Why is it so? The words here says it all. 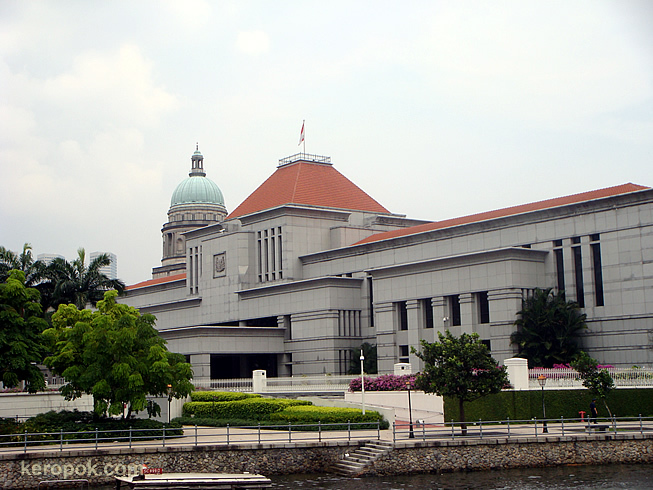 This is the Singapore Parliament House. This view with the financial district behind. This view from the riverside. If you would want to read more about it, read yesterday's link or you can also try Wikipedia. 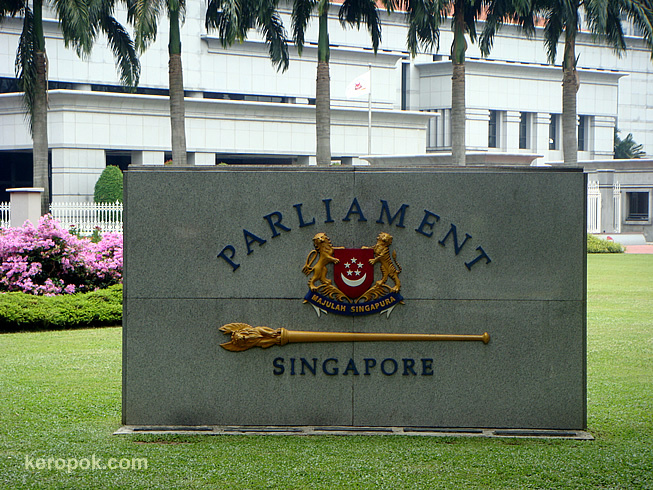 This is the plaque/sign right in front of the Singapore Parliament House. There are also tours if you wish to visit. Check the Parliament website for details. 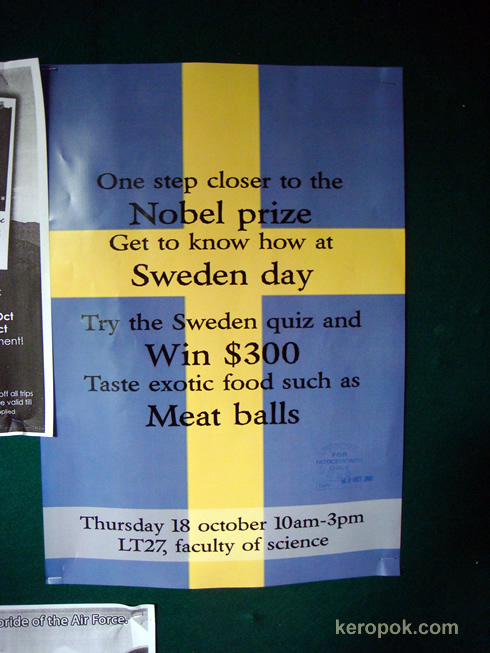 Free Swedish meatballs in NUS! Hey, if you are studying or working or loitering around NUS today, you should stop by LT27. Colleagues and I saw this poster. Any swedish meatball fans out there? If you are following, these few days pictures are taken from around NUS. Colleagues and I, we were walking around lunch time. We thought this look a bit different. Yes, it is. 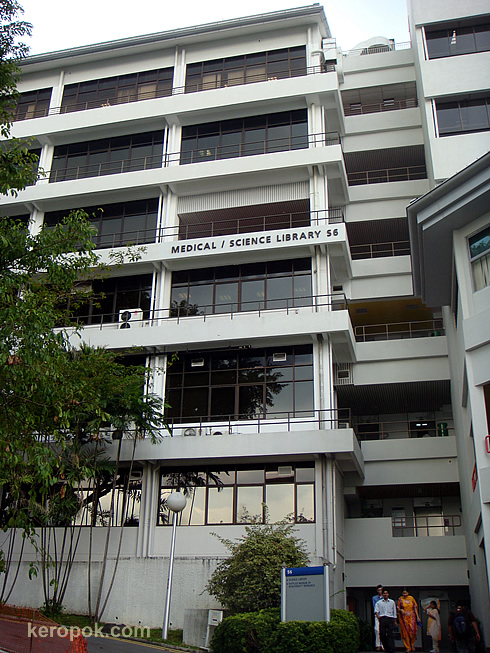 The NUS Medical and Science library seems to have merged. Do you visit the libraries in your city often? How many mini chimneys can you see? I was walking around on the NUS campus and saw this. How interesting! How many chimneys can you see? There are more not shown in the photo! It's spotted at the Sciences blocks. This was taken at the Singapore Zoo. The gardeners sure did some good work trimming this to look very much like the real thing :) And it looks like a very young elephant. Thought it look quite cute. Does your country or city have something that like in at the local zoo or parks? Some cities have huge chess pieces where people can moved it around and have a game. Does your city have something like that? Do you like to play chess? This is the first and only indoor bus interchange which Singapore has. This has been built for some years now. 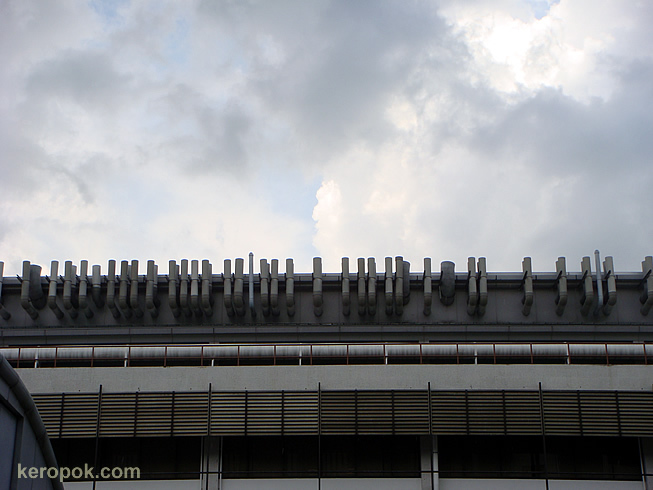 Those who use this interchange lots, is grateful for the air condition in hot Singapore. People will still queue around the stainless steel railings inside. Do you see the glass doors where the exit sign is? That's where the glass doors are. When the bus arrives and is ready board passengers, the glass doors will open and passengers will slowly board the bus. Passengers can "hide" indoors first, before the bus arrives :P Does your country or city have an indoor terminal or interchange? There was another post of a outdoor bus interchange earlier last month. Ayer Rajah Expressway in the early morning..
Last Friday, a group of us were in a chartered bus going for a retreat. 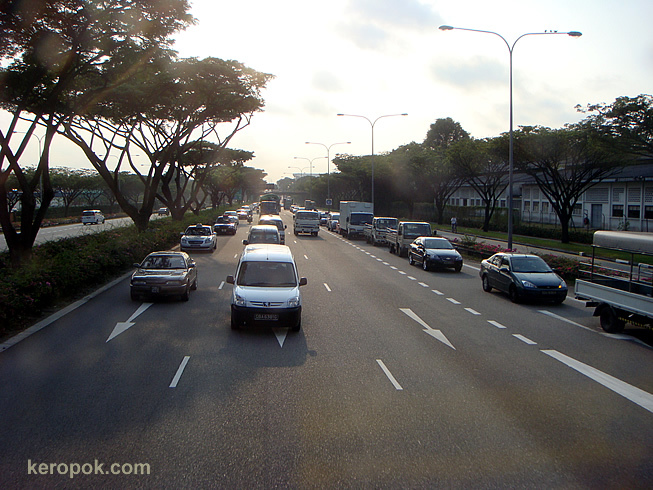 This is a view of the Ayer Rajah Expressway taken from the back of the bus. The traffic was still quite ok, as we were going out of the city towards the immigration checkpoint. Does you city have double deck buses? 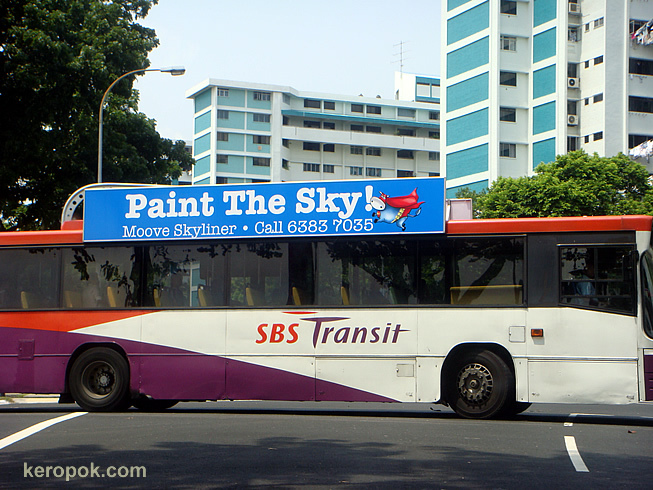 In Singapore, one of the two major bus companies, SBS Transit has quite a few of these double decks. It's a screenshot of the food I have in my (fluff)pet. 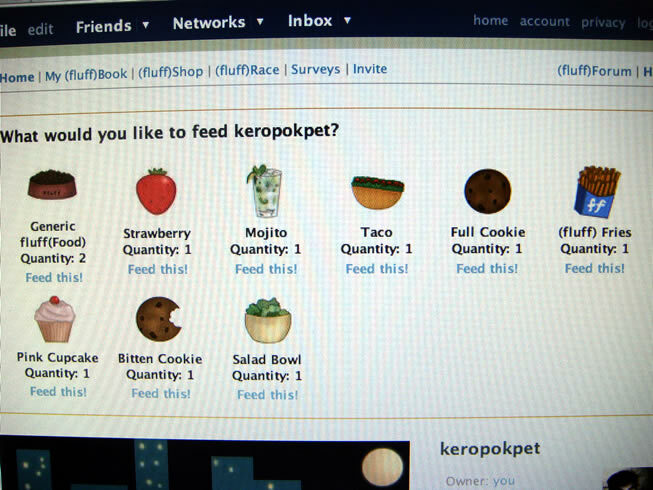 I feed my pet quite a lot of food. Friends who are connected on facebook says I am mad to have a pet that is currently at 4468 fph. haha.. But I have seen others who are more!!! Are you on facebook and are you addicted to it? This is actually a picture of a rails on the ceiling. But it has not been used anymore I think. They used to carry boxes, boxes filled with documents and other stuff and they travel from one part of a building to the other. 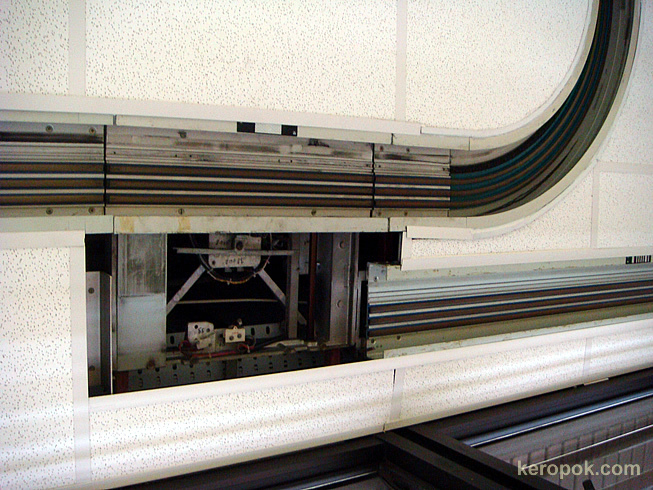 It hangs on the ceiling so and follows the rail. Computerization and storage of files in electronic form has made this obsolete. 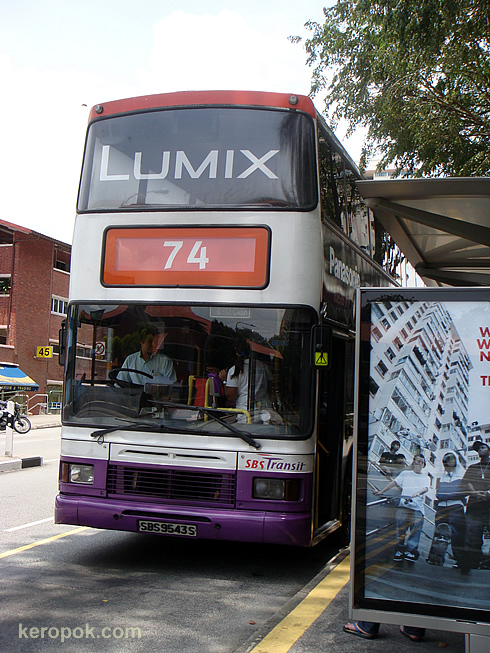 Just happen to see the new advert that was on the bus. I think I saw a post on it at one of the New York Daily Photo. Does it happen frequently in your city? 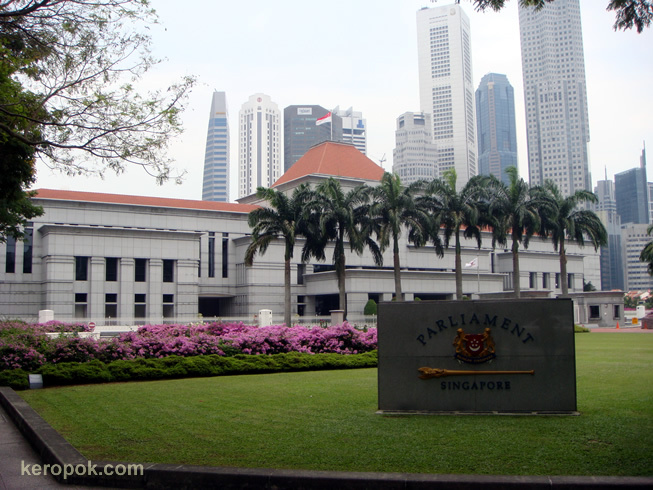 Where I stood in the photo yesterday, on my right, I could see the CPF Building. It's quite unique eh? I always think it looks like lego blocks, as it looks like 3 sections stacked on top of each other. Do you have a similar compulsory retirement savings scheme in your country? I know neighboring Malaysia has a EPF, Australia has some superannuation thingy. What about your country? I was standing at the traffic light waiting for the traffic light to turn green. It is around 7 pm, thus the dark sky. Do you think your 24 hours is enough everyday? 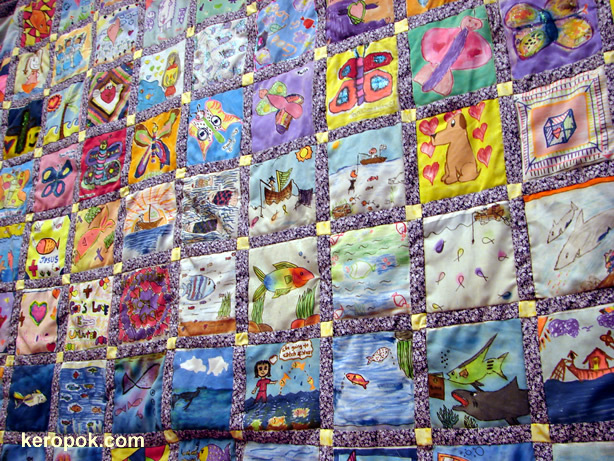 It you wanted to zoom in to see how the patchwork looks like for yesterday's post, here it is. How true that statement. Do you think so? I was attending a wedding in a church the other day, and I saw this. It's so beautiful! It was hung on the back wall. 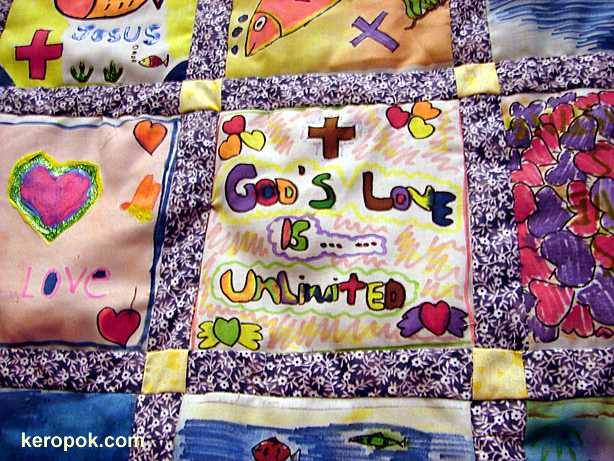 Do you love patchwork like this? A snapshot of a lunchtime traffic along AYE (Ayer Rajah Expressway). 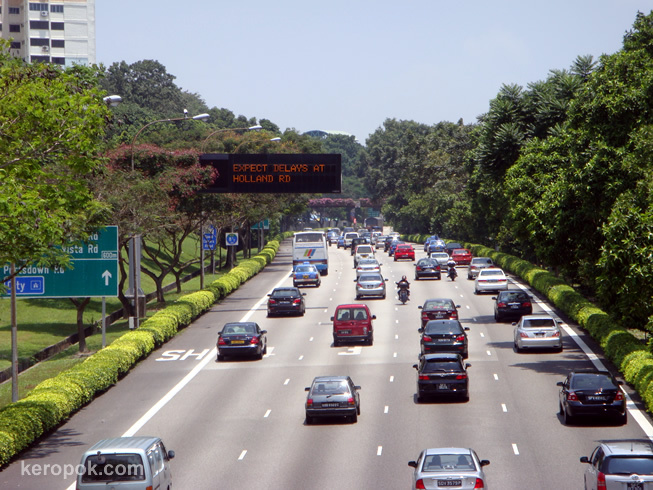 On the expressways in Singapore, there's always this board that tells you of traffic conditions ahead. 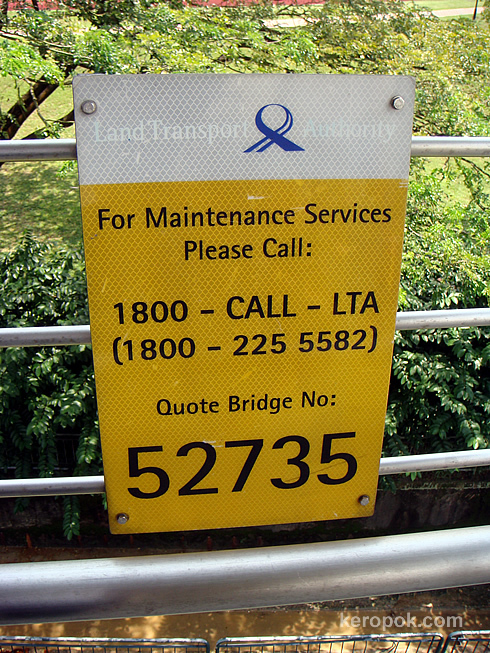 It is known as EMAS to the locals, and it stands for Expressway Monitoring and Advisory System. 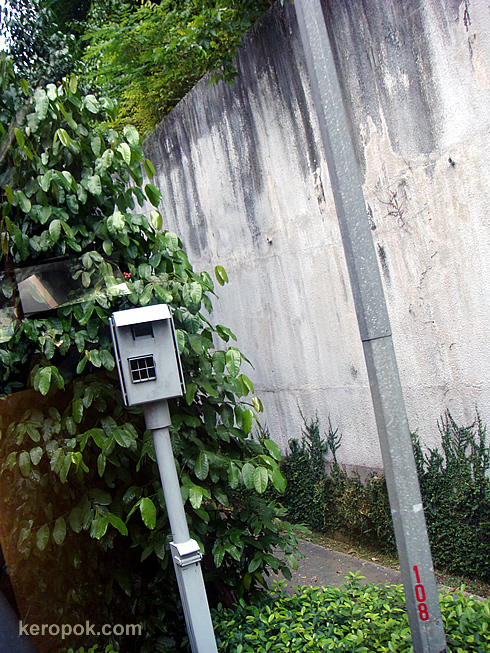 The system allows the Land Transport Authority (LTA), to monitor the traffic situations and inform users. Does you city have a similar system? Every overhead pedestrian bridge has its own ID. I am into Signs mood again. I am usually quite law abiding, so I usually use the overhead bridge to cross roads. One thing I realise though is that for every bridge, there's a Bridge No. So.... does your city have lots of overhead bridges? Are they also clearly labeled? It's the Daily Photo Bloggers Theme Day again! This month the theme is Cemeteries / Tombstones. 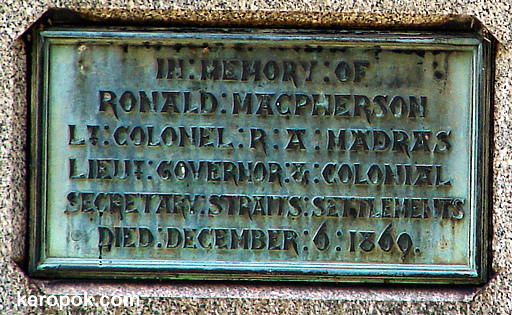 I am posting a memorial that was built for Lieutenant Colonel Ronald MacPherson (1817-1869). 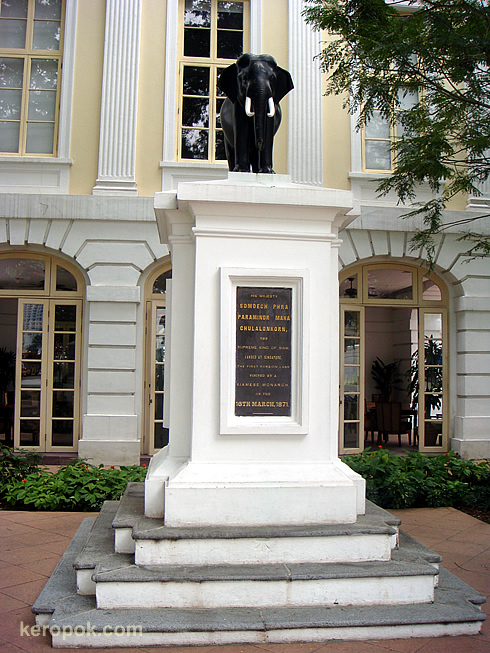 He was the first Colonial Secretary when the Straits Settlements became a Crown Colony in 1867. If you have been to Singapore and seen the beautiful St Andrew's Cathedral, it is Ronald MacPherson who designed it. It is suppose to be the finest specimen of ecclesiastical architecture in the east. 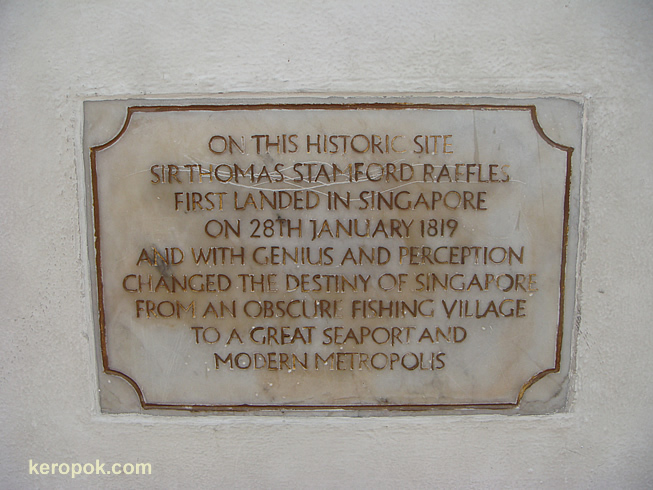 The MacPherson area in Singapore and MacPherson Road is also named after him. 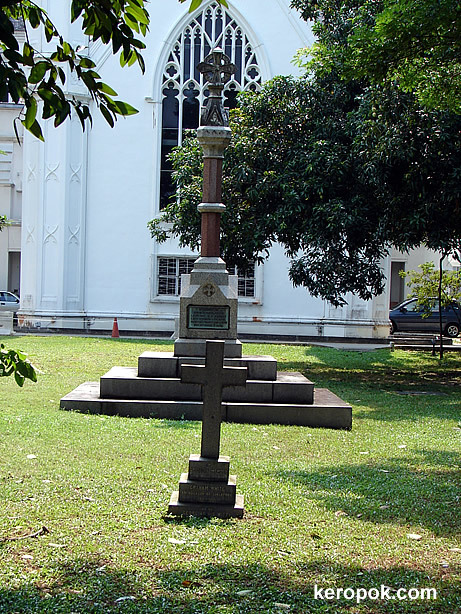 This memorial stone can be found in the grounds of St Andrew's Cathedral. These fellow Daily Photo Sites around the whole are also participating in the Theme Day. See how the theme is being interpreted in different cities. Due to different time-zones, some photos might appear at a later time.